What is special about “data-intensive development”: the growing presence and application of data in the processes of international development? We can identify three levels of understanding: qualities, affordances, and development impacts. Overused they may be but it still helps to recall the 3Vs. Data-intensive development is based on a greater volume, velocity and variety of data than previously seen. These are the core differentiating qualities of data from which affordances and impacts flow. Datafication: an expansion of the phenomena about which data are held. A greater breadth: holding data about more things. A greater depth: holding more data about things. And a greater granularity: holding more detailed data about things. This is accelerated by the second affordance . . .
Digitisation: not just the conversion of analogue to digital data but the same conversion for all parts of the information value chain. Data processing and visualisation for development becomes digital; through growth of algorithms, development decision-making becomes digital; through growth of automation and smart technology, development action becomes digital. Digitisation means dematerialisation of data (its separation from physical media) and liquification of data (its consequent fluidity of movement across media and networks), which underlie the third affordance . . .
Generativity: the use of data in ways not planned at the origination of the data. In particular, data’s reprogrammability (i.e. using data gathered for one purpose for a different purpose); and data’s recombinability (i.e. mashing up different sets of data to get additional, unplanned value from their intersection). i. (In)Visibility. The affordances of data create a far greater visibility for those development entities – people, organisations, processes, things, etc. – about which data is captured. They can more readily be part of development activity and decision making. And they can also suffer loss of privacy and growth in surveillance from the state and private sector. Conversely, those entities not represented in digital data suffer greater invisibility, as they are thrown further into shadow and exclusion from development decision-making. Dematerialisation and generativity also make the whole information value chain increasingly invisible. Data is gathered without leaving a physical trace. Data is processed and decisions are made by algorithms whose code is not subject to external scrutiny. The values, assumptions and biases inscribed into data, code and algorithms are unseen. ii. Abstraction. A shift from primacy of the physical representation of development entities to their abstract representation: what Taylor & Broeders (2015) call the “data doubles” of entities, and the “shadow maps” of physical geographies. This abstraction typically represents a shift from qualitative to quantitative representation (and a shift in visibility from the physical to the abstract; from the real thing to its data imaginary). iii. Determinism. Often thought of in terms of solutionism: the growing use of data- and technology-driven approaches to development. Alongside this growth in technological determinism of development, there is an epistemic determinism that sidelines one type of knowledge (messy, local, subjective) in favour of a different type of knowledge (remote, calculable and claiming-to-be-but-resolutely-not objective). We could also identify the algorithmic determinism that increasingly shapes development decisions. iv. (Dis)Empowerment. As the affordances of data change the information value chain, they facilitate change in the bases of power. Those who own and control the data, information, knowledge, decisions and actions of the new data-intensive value chains – including its code, visualisations, abstractions, algorithms, terminologies, capabilities, etc – are gaining in power. Those who do not are losing power in relative terms. The idea of functionalities leading to affordances leading to impacts is too data-deterministic. These impacts are not written, and they will vary through the different structural inscriptions imprinted into data systems, and through the space for agency that new technologies always permit in international development. Equally, though, we should avoid social determinism. The technology of data systems is altering the landscape of international development. Just as ICT4D research and practice must embrace the affordances of its digital technologies, so data-intensive development must do likewise. What Taylor & Broeders (2015) not entirely convincingly argue is a change from overt and consensual “legibility” to tacit and contentious “visibility” of citizens (who now morph into data subjects). Network Geography and Global Development: Dependency Redux? The SDGs can be taken as a marker of transition from international development to global development worldviews. Among other aspects of global development is a universalisation of development: development is everywhere; not just associated with the global South. What does this mean for the geography of development? One response would be to retain a physical, spatial approach to geography, but to move on from the old bipolarity of developed vs. developing; North vs. South. Alongside moving upward to the global, this would move downward to the local; for example to regions, cities, “pockets of poverty” and the like[i]. An alternative would be to move to a network geography of development. Social networks and transportation links mean networks have always been fundamental to development. But telecommunication links – particularly digital links during the 21st century – have significantly accelerated the presence and salience and complexity of networks in development. These exist as physical networks (such as physical infrastructure grids), virtual networks (such as online communities of practice) and most often as hybrid networks (such as supply chains and their parallel digital representations), so a network geography combines the physical and non-physical. The explosive growth of networks in development demands greater use of network-based conceptualisations, including network geographies[ii]. Three main geographies can be applied to understand these networks. First, a processual geography that focuses on the flows between nodes in the network (e.g. flows of aid between networks of development NGOs[iii]). Second, a structural geography that focuses on the shape of the network (e.g. the impact of different network structures on water governance in Costa Rica[iv]). Third, a relational geography that combines aspects of both flow and shape (e.g. the resource networks drawn on by development champions[v]). Conceptualisation of these network geographies has come from a number of sources[vi]. Examples include social capital drawing from new institutional economics, global production networks drawing from economic geography, networked governance drawing from political science, embeddedness drawing from new economic sociology, and complex adaptive systems drawing from complexity theory. However, if the spatial geography of old is to be supplanted, it will be by a new spatial geography; one that replaces position in the physical world with position in the network (physical, virtual, hybrid). The positional network geography of development has often used the binary of being either inside or outside the network (e.g. Castells’ notion of the excluded “Fourth World”, or conceptions of the digital divide). More sophisticated versions have added the category of “have lesses” between the “haves” and the “have nots”; those who are within the network but at the periphery. Given, at least for digital networks, the dwindling numbers who are truly excluded, this is a more appropriate conceptualisation. The positional geography of development thus becomes a geography of network position: distinguishing those actors at the core of the network from those at the periphery who are marginal and precarious. While this might be an idea suitable for the 21st century nature of global development, it has earlier origins. It sounds very similar to dependency theory, with its ideas of core and periphery. Though long out of favour, this could provide one approach to a positional network geography of development; a revival supported by some in development studies[vii]. Moving beyond the simple binary of core/periphery to world systems theory’s core/semi-periphery/periphery; or even to the idea of a spectrum of network positions. Associating network position with differentiated roles vis-a-vis the production and capture of value, and with differentiated flows and ownership of resources. Recognising the reproduction of network position through power; particularly the power of innovation, knowledge and technology. A positional network geography of development would need to move away from dependency’s nation-state-centric approach, recognising many other units of analysis; and it would need to recognise the (constrained) potential for mobility of network position. Work on global production networks has taken some of these ideas and demonstrated their relevance to another unit of analysis, but this needs to be extended to all forms of networks; not just global but regional and local; not just productive but political and social. Indeed, one would need to recognise that any development actor lies not within a single network but within multiple networks; potentially with somewhat different positions in each. These would include locally-embedded as well as disembedded networks. Recognition of the relational, institutional and cognitive/symbolic sources of power within the network; and the potential for network-specific conceptions of power[viii]. Recognition of the role played by the new technologies that increasingly mediate, enable and constrain the networks of global development; requiring some socio-materiality to be incorporated[ix]. Recognition of the increasing potential for quantification of positionality via social network analysis; a tool which can add absent methodological rigour[x]. “Open development” is a concept with some momentum in the ICT4D field, encouraged particularly by support from IDRC. A core challenge has been theorisation of open development, and here I briefly propose and test the idea that institutional logics can offer such a foundation. Open logic: a cooperative logic that values openly-accessible inputs, participative and collaborative processes, and shared distribution of benefits. We can understand these ideas better by applying them to a real open development ICT4D case; selecting here the iDART system – open source software developed in South Africa by Cell-Life to help pharmacists dispense anti-retroviral drugs to those with HIV/AIDS. The case has been written up by Melissa Loudon and Ulrike Rivett, and is here reinterpreted through a logics lens. Cell-Life originated as an inter-university collaboration in Cape Town and, as such, has been heavily influenced by the institutional logics that operate within academic organisations. Universities can be understood as sites of conflict between open and closed institutional logics; with the latter traditionally dominant but the former finding voice. Examples of the constitution of the two institutional logics and their material (resources, processes, structures) and symbolic (culture) elements are shown in the table below, drawn from the case study. System development processes: system developers with a background of closed processes encountered with some difficulty very different open logic imperatives within the project. Intellectual property rights: the university’s approach to software – proprietary IP that would be commercialised to the benefit of the university – conflicted with the open source approach underpinning Cell-Life’s work. Software market: direct rivalry occurred between open-source iDART software and competing proprietary pharmacy management software. There were also conflicts over the closed focus on disciplinary silos vs. the open logic of multi-disciplinary action research. Compromise: a hybrid approach that combines aspects of both open and closed logics. System development processes were neither completely open nor closed, but a mix of the two. Users were involved through feedback on prototypes but the Cell-Life team retained control over the development process, often acting as proxies for users and acting as overall custodians of the system. Some but not all user revision requests were incorporated. Protected Niche: Cell-Life created a protected niche of open logic, with barriers created against closed logic. After five years within the university system, Cell-Life was spun-off as a non-profit entity, thus increasing the structural barriers and distance to the dominant closed logic of the university system. The software itself was developed to focus particularly on low-resource, rural pharmacies; a market niche not targeted by closed-logic-based commercial vendors. First, that the idea of open vs. closed institutional logics is applicable to open development projects. Institutional logics offers a new language; a new way to describe and explain what has happened on the project. From this brief analysis, it’s not clear what new insights it provides beyond this; but that may be the nature of this post-hoc, external reinterpretation. There is certainly a case for pre-hoc application of institutional logics – definitely, to analyse open development; likely, to analyse ICT4D more broadly – to help describe the outcome of conflicting logics; to explain when one logic dominates another; to understand how to deal with conflicting logics in practice; and to identify the role of open development/ICT4D champions as institutional entrepreneurs. Second, and assuming we could generalise the idea of conflict between open and closed logics, this suggests that achieving true “open development” may be very difficult: there will always be pressure to hybridise. But not only might fully-open development be unfeasible, it might also be undesirable. Indeed, both extremes might be undesirable: closed development because it leads to inequality and exclusion, open development because it leads to disincentives to action and potentially-ineffective or chaotic outcomes. One can see the latter in the case study, which restricts the openness of processes not only because of the pressures of closed logic, but also for reasons of project effectiveness and efficiency. The evidence base here is just preliminary, but could suggest – assuming most development systems lean further to the closed than open end of the spectrum – that the objective should be “more-open development” rather than “fully-open development”. How can we explain the negative consequences associated with ICTs: the digital deficit and digital ills identified in the 2016 World Development Report? As summarised earlier, the Report itself blames the digital deficit – inequity in the distribution of ICT benefits to a few “haves” rather than the many “have nots” – on two divides: a digital divide of very uneven access to the digital infrastructure; and a social divide of inadequate policies, skills, and (public sector) institutions. And it ranges a little wider in identifying authoritarian states, vested interests, and monopolies as the source of some negative ICT-related impacts. The teleological error: the association of ICTs solely with their intended purposes; assuming that policy needs only focus on removing barriers to diffusion and adoption to deliver development. The structural error: the association of ICTs solely with “imminent development” (incremental, short-term, development driven by individual agency), ignoring the association of ICTs with “immanent development” (the development that emerges from the deep structures of society). Closed logic: a competitive or controlling logic that values restriction of inputs, processes and benefits to particular individuals or groups. Reinforcement: cases in which the dominant closed logic is reproduced, or extended, or augmented through use of ICTs. Examples abound: electronic surveillance of citizens by autocratic regimes; the lack of impact of e-procurement systems on bribe-paying and bid participation rates; capture of e-participation systems by political elites; and development of digital monopolies. Insurgence: cases in which the subordinate open logic is strengthened through use of ICTs. For instance, crowdsourcing to report and reduce electoral violence and fraud, creation of open learning systems, or crowdfunding platforms. But these are fewer and weaker than the reinforcement examples. So there is a sense of marginality: incremental gains that do not disturb the underlying closed logic – sometimes perhaps deliberate “openwash” that coats closed logic with an open veneer. Metamorphosis: cases in which ICTs initially support open logic which is then translated into closed logic. A number of the Report’s sharing economy examples have followed this trajectory; for example, mutating from non-profit to for-profit. The Sustainable Development Goals are clear that development to date has been too incremental, and needs to be transformational. If we take that seriously, then ICT4D must attend to its teleological and structural errors; in particular, asking how ICTs can accompany or even facilitate structural transformation. This does not mean spurning closed logic and supporting only open logic – competition, control and cooperation are all fundamental human impulses, and none of them alone can deliver development. But ICTs cannot help deliver the SDGs’ radical agenda if they simply help closed logic grow at the expense of open logic. This means more ICT4D research on the role of digital technology vis-a-vis the immanent development that emerges from society’s deep structures, and more ICT4D practice that recognises and engages with those structures. Adapted from Murphy, J.T. & Carmody, P. (2015) Africa’s Information Revolution, John Wiley & Sons, Chichester, UK. See, e.g., Fuchs, C. (2008) Internet and Society: Social Theory in the Information Age, Routledge, New York. What can actor-network theory offer to our understanding of technology and development? This blog entry summarises the answer from an open access paper in the journal Development Studies Research: “Technological Change in Developing Countries: Opening the Black Box of Process Using Actor–Network Theory”, and it builds on an earlier entry on ANT and development. Technology rather dropped from the development agenda during the 1980s and 1990s, but has re-emerged strongly in the 21st century; not least due to the spectacular diffusion of ICTs. It has been de-humanised: organisations are recognised as actors but people – as identifiable individuals with agency – rarely appear in the technology and development literature. Technology may be understood as a physical artefact, as a system of elements, as the embodiment of knowledge. But it is not seen as playing any active role: technology is acted-upon but is not itself acting. Research has tended to study factors or social structures affecting processes of technological change. But it does not describe those processes in detail: actual practices of change tend to be black-boxed. In sum, research to date has typically stood outside the technology processes it seeks to investigate; freezing them in time and concealing their main actors. As luck would have it, these are just the kind of lacunae that actor-network theory was intended to address. Yet application of ANT to cases of technological change in developing countries has been rare; and within development studies literature, almost non-existent. So new ANT-based case studies of technology and development are required to assess what insights actor-network theory can offer. One such case study – applying Callon’s “moments of translation” to a digital information system in the Sri Lankan public sector – is presented in the Development Studies Research paper (which should be accessed for full details). It finds that an initial network supporting technological change fell apart in mid-project, and had to be reconstructed around a new technology design and a new vision for future change. Methodological: admission of subjectivity in framing an ANT-based case, and problems of thinning out detail to fit a journal-length account. Analytical: that ANT can provide a rich description of how things happen, but stutters in seeking to analyse why. Instrumental: the difficulty of extracting practical guidance from ANT other than rather “Machiavellian” prescriptions. Networks: explaining the networks of relations that both support and oppose technological change, and also the detailed process by which they come to be formed, dissolved, etc. Technology: exposing the active role that technology plays in international development – shaping, enabling, co-operating, resisting, etc. Human practices: providing a detailed account of the role played by individuals and groups in technological change; particularly the way in which lead actors modify the perceived interests and even identities of others involved. ANT therefore shows us not just that human interests, identities and relations change in a technology-and-development project; it also explains in what way they change, how it is that those changes come about, and how they relate to the project’s trajectory. How do we explain the trajectory of a technology and development project? How does a particular innovation in a developing country diffuse, scale up or sink without trace? What role does technology play in processes of technological change? How does power manifest itself in such processes? How are apparently relatively powerless actors sometimes able to influence the direction of technological change? How are apparently relatively powerful actors sometimes not able to get their way on a technology project? As the technology used in development becomes more complex, more interconnected, more intertwined into the lives and livelihoods of developing communities, and changing at an ever-faster pace; then ANT will likely become more relevant and more useful as a conceptual frame. There has been a small but substantive engagement to understand how the capability approach of Sen and others could be applied in the ICT4D field (e.g. Andersson et al 2012, Kleine 2013). One of the key challenges is the granularity of the capability approach. It requires us to break down development not merely to the level of individuals but to the level of single capabilities or functionings. Thus, at least in theory, generating a list that is many billions-long. The capabilities approach can therefore only be operationalised by aggregation: a simplification that groups capabilities into a relatively few categories (e.g. Alkire 2002), or which aggregates from the individual to the group (e.g. Thapa et al 2012). In this blog entry, I propose a different type of aggregation, via the notion of the “roles” people play in relation to ICTs. Developing from the concept of roles within the workplace (e.g. Biddle 1986, Huvila 2008), we can define a role as a set of tasks and behaviours that are performed by an individual. Roles therefore represent something halfway between a realised functioning and a livelihood. They are shaped by “a mix of both social dynamics and technological affordances” (Postigo 2011:184). 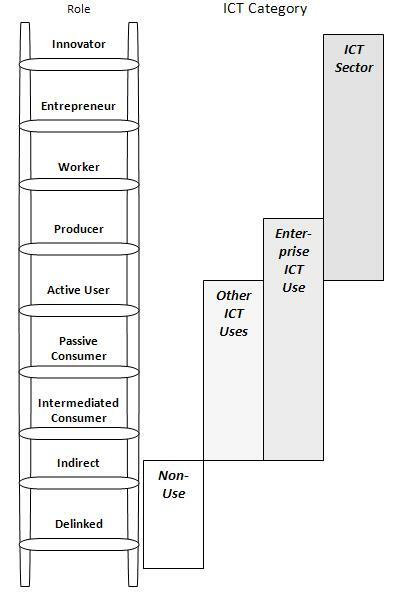 Here, a set of roles will be analysed that people can play vis-à-vis ICT; represented as a ladder, as shown in the figure below. In simple terms, climbing the ladder could be read as a greater intensity of engagement with the technology. It is also a ladder of technological capability; each step reflecting higher-level competencies (skills, knowledge and perhaps also attitudes) that are required for this type of ICT use but which are also created by this type of ICT use. And it also represents Sen’s ideas, with each successive role being a greater level of realised functioning. The various roles can be understood in relation to categories of ICT use. These are summarised in the figure and detailed below, selecting examples of particular relevance to those in low-income communities. For further details, see the online paper: “ICTs and Poverty Eradication: Comparing Economic, Livelihoods and Capabilities Models”. Delinked: there is no obvious connection between particular ICT applications and poor communities. An example might be applications within a large corporation which does not produce goods or services of relevance to poor communities. Indirect: this represents a very large category of ICT applications in organisations in which the poor have no direct connection with the ICT, but in which the ICT application does deliver some benefit. Examples might include the use of ICTs in large firms to improve supply, distribution and marketing to base-of-the-pyramid markets. Intermediated consumer: this can represent all three main levels of consumption-related use of ICTs – one-way broadcast of information, interaction, transaction – but in no case is the consumer a direct ICT user; hence there is limited ICT-enabled change in role. A typical example might be the delivery of e-government services, undertaken at kiosks and service centres staffed by intermediaries. Passive consumer: a role in which there is direct use of the ICTs but just to receive “broadcast” information e.g. about health or market prices. Active user: digitally-enabled interaction and transaction with socio-economic contacts; for example, the remittance of “mobile money” from urban migrants to rural relatives, or the use of telecentres by farmers to get agricultural guidance from distant advisers. Producer: creation of enduring digital content. This could be undertaken by an entrepreneur, for example, advertising goods and services on a voice-activated information service. But it also overlaps into the ICT sector category; for example, musicians or video producers recording then sharing content on mobile phones. Worker: employment in an ICT-based activity (one that could not exist without ICTs); for example, those employed to undertake data entry and other digitisation tasks as part of IT impact sourcing contracts. Entrepreneur: creation of a self-employed ICT-based livelihood (one that could not exist without ICTs); for example, the umbrella people selling phone calls by the roadside, or those who set up PC kiosks providing digital photography, e-ticketing and e-government services. Innovator: adaptation of the technology by modifying the technology itself such as the “street hacks” that alter mobiles to accept dual SIMs, or by modifying ICT-enabled processes such as the mobile money agents who adapt methods of service delivery to match their local context. Any attempt to aggregate capabilities has its downsides, since it must necessarily simplify away some of the richness of Sen’s ideas. However, the use of roles – whether those proposed above or others – as an analytical approach offers a fairly straightforward and robust way of evaluating ICT4D initiatives, which does some justice to the intentions and insights of the capability approach. Further work now needs to be done to dig into the literature on work-roles, life-roles, social-roles and role theory, in order to provide a stronger foundation for the role ladder.